Croc near one of the five colored crystals. 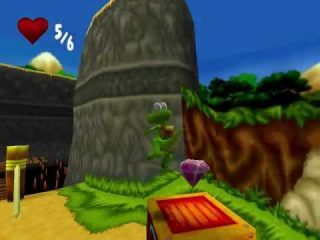 Croc 2, as the name suggests, is a sequel of a (probably) more well known game: “Croc – The legend of the gobbos”. The reason why I decided to play the second game rather than the first one is easely explained. First of all, I’ve been introduced to the Croc series (if you can call a series a franchise with only two games) by playing the second one first. 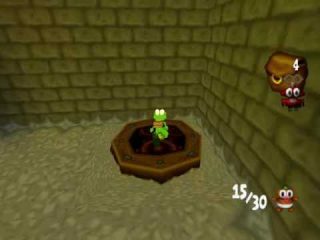 I was probably around 7 when I got my hands on the disk and I enjoyed so much playing Croc 2. With time, like many other of the games of mine, the disk got lost, and only recently I managed to play it again. And finally fininishing it, because I wasn’t so good at playing back there when I was a little kid. I’ve played the game a lot since then, and I still play it now. It almost has no secrets to me (then again, we all know that the new trick/glitch is just around the corner for someone to discover) and I even tried to play the first game. The first game was released for Playstation 1 and PC and while it gave inspiration to the sequel, it’s also a little different. The first difference it’s mainly in its difficulty. Croc 1 is way harder than Croc 2 (not that Croc 2 is easy but after a couple of playthroughs, it’s all manageable) and the way Croc’s health is handled is different. In the first game if you’d get hit, you’d lose some crystals but if you didn’t have any you’d lose a life. In Croc 2 you have a certain amount of hearts and if you get hit you lose one. Getting hit with no hearts results in a game over. Since you can have up to 9 hearts in Croc 2 it makes it very hard to incurr in a game over. Fighting Soovena the Squid in the first world. 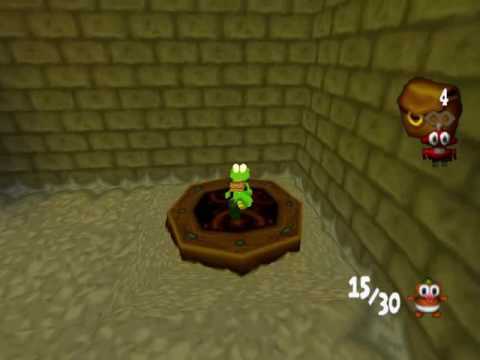 But if we leave the difficulty apart we can praise Croc 2 for creating more intresting levels than Croc 1. Interesting in terms of plot I mean. In Croc 2 you are presented a task upon entering each level. A task which might be just “save the gobbos” or “gather the treasure in the mines” or even “get back my sandwich from that crow who stole it”. This adds some importance to the levels as you are helping the gobbos of the villages by solving their problems. It feels like you are doing various mission even if all the levels are about jumping on platforms and defeating enemies (as you wohld expect from a platform game). Let’s talk about the gameplay though. In Croc 2 you control the little crocodile Croc who, despite can do only a few things, ends up being very versatile. 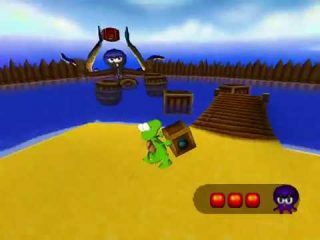 Croc can jump, stomp enemies, bounce on the ground, spin and attack with his tail, make spinning jump and use a various items to help him on his quest. In the game you will travel through four world and in each one you have to do several missions, two of which are about fighting a boss. There is also a special mission which we’ll discuss in a second. While you could go through the game by simply achieving each mission’s goal, the game wants you to do more. In each level there are five colored crystals to collect other than the 100 normal crystals. While the normal crystals are used to replenish health (collect 50 to get back one hearth and collect 100 for a full restore) and as credits to buy items, the colorefdcrystals are needed to unlock the golden gobbo challenge. This is a bonus room that if you can clear nets you a golden gobbo statue. There is a Golden gobbo statue in each level (except boss levels) and collecting them all grats you access to the special mission in the world you are in. In that mission you are to find a puzzle piece and collecting all 4 puzzle pieces is the only way to complete the game at 100%. Croc as he’s about to use a Mechanical Gobbo to access an hidden area. The mechanic I love the most about Croc 2 however is the item mechanic, something that Croc 1 didn’t have. Basically to collect every item in the levels you are required to use items to access certain places. From Jelly Jumps to reach high places to mechanical gobbos which you can remotely control Croc can use a few kind of items to gather all the crystals. The catch is that the items must be bought at a store at the cost of crystals. This adds to the game a bit of RPG which can’t be a bad thing…right? Talking about story…well let’s just say that there are games with better stories to tell but for a platform, Croc 2 does the story-telling job pretty well. And even if there aren’t a lot of characters I personally liked how the little cute Gobbos, compared to Croc 1, can now speak and show many emotions. So that’s Croc 2. As always I recommend you play this game if you have the opprtunity. And if you haven’t my Lets Play is here for this.